Cover Verse: A great boss provides just the right blend of trust and guidance. 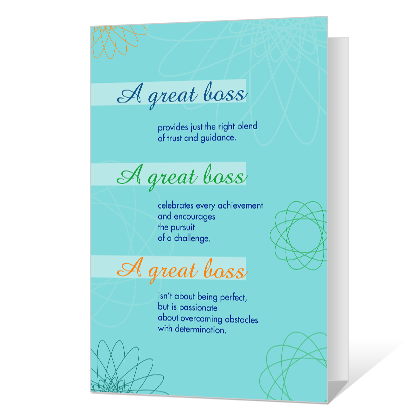 A great boss celebrates every achievement and encourages the pursuit of a challenge. A great boss isn't about being perfect, but is passionate about overcoming obstacles with determination. Inside Verse: Happy Boss's Day Thanks for being one of the great ones.